This is another recipe that I always enjoyed while being in Romania and I never got a chance of making it until now. Well, in fact it’s been sitting on my desk for few months now but there always seem to be something else more important to do every time I think of writing this recipe. Anyway, the original dish comes from Moldova, the eastern region of Romania not the Republic of Moldova, they are two different things but I will leave history lessons for some other time, where it is generally called ‘Tochitura’. Made with pork and served with polenta, it is usually accompanied by smoked sausages but this is a somewhat modern interpretation though I like them both. If you decide to use sausages though, make sure you stay away from the Italian kind that you can find everywhere, look for Polish or Hungarian smoked sausages or anything else you can find of Eastern European origin. I used kabanos sausages that I am lucky to find them in huge quantities and a small neighborhood grocery store with Polish specific. 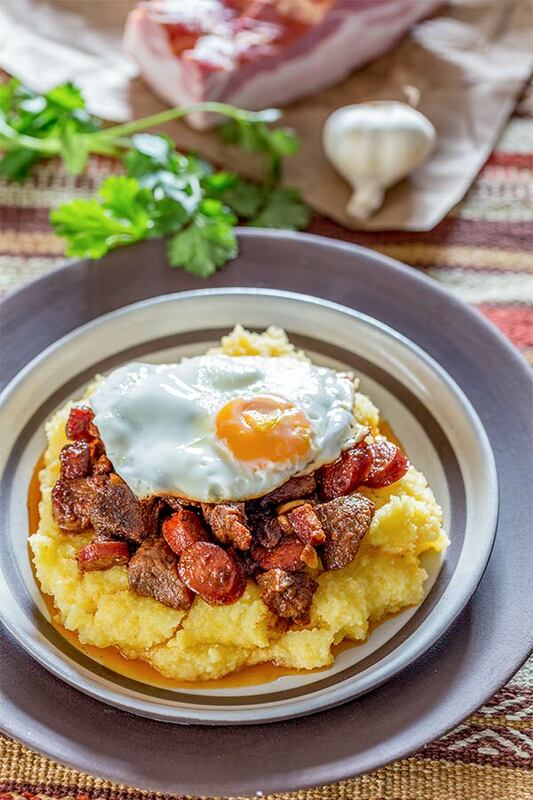 ‘Tochitura’ is usually served with polenta and a sunny side up egg on top but you can enjoy it the way you want, the experience will not diminish in any way. Enjoy! Cut meat in pieces and chop the garlic but not too small. Fry the bacon until the fat melts a little bit then add the pork and fry until is properly browned on all sides. Add sausages and fry for 3-5 minutes on medium heat. Add the garlic and saute for 1-2 minutes then pour in the wine along with a couple of bay leaves, cover and cook on medium to low heat for about 30 minutes. Depending the size of the pan, you might need to add some more wine or water, up to you just make sure is enough liquid so the meat doesn't burn. Final step would be to add all the herbs and cook it for another 10 minutes, covered. The dish is called a stew but is not actually, there is not that much sauce but if you like to do some more dipping then you can adjust the consistency by adding a bit more water or tomato juice... but not too much. Use my picture as a reference.